Easter may have started out as a religious festival, but let’s face it. Today, it’s all about the eggs benedicts and chocolate bunnies. But we’re not complaining because it’s just another excuse to par-tay! 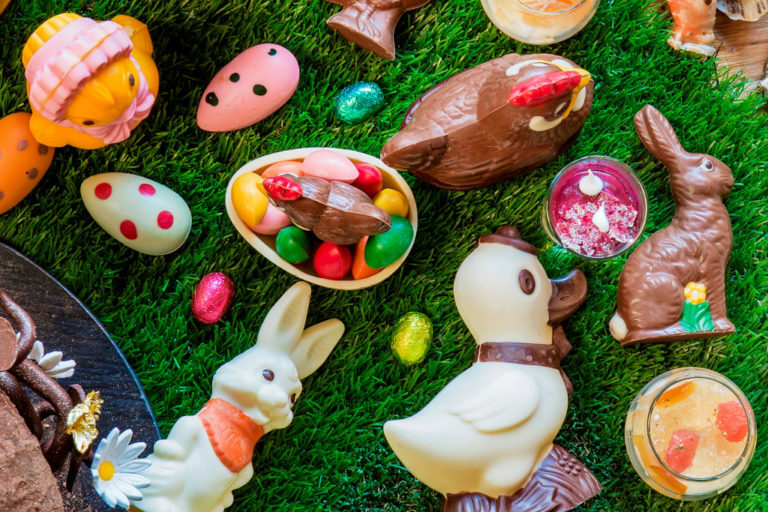 To get you into the Easter bunny spirit, we’ve put together a massive list of 30 places to get the kids busy with eggciting activities. The adults can also wine and dine to your hearts’ content. Thinking of throwing your own Easter party instead? Don’t tear your hare out. Just scroll on down to find out where you can poach eggstra special goodies that are sure to put smiles on your guests’ faces. The Party Elves Easter Picnic returns with its signature Easter egg hunt, games and activities for the whole family. There’ll be sack races, egg-decorating, face-painting…and even showers of bling! Each child ticket includes one breakfast voucher, while parents and tots under 2 years enter free. Just bring a picnic mat for a morning of fun, or make a reservation with Buzz in the Woods and order up some brunch favourites. Stay for lunch and enjoy 10 per cent off too. 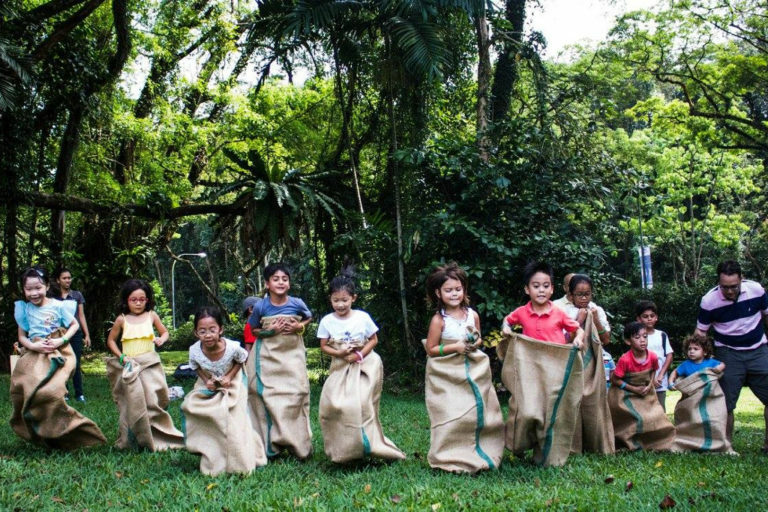 In the spirit of Easter, Camp Kido invites kids to hop into a day of learning and adventure by the riverside. Campers can look forward to a bunch of Easter-themed activities suitable for kids from five to 10 years, although kidults – and even pets – are welcome too! 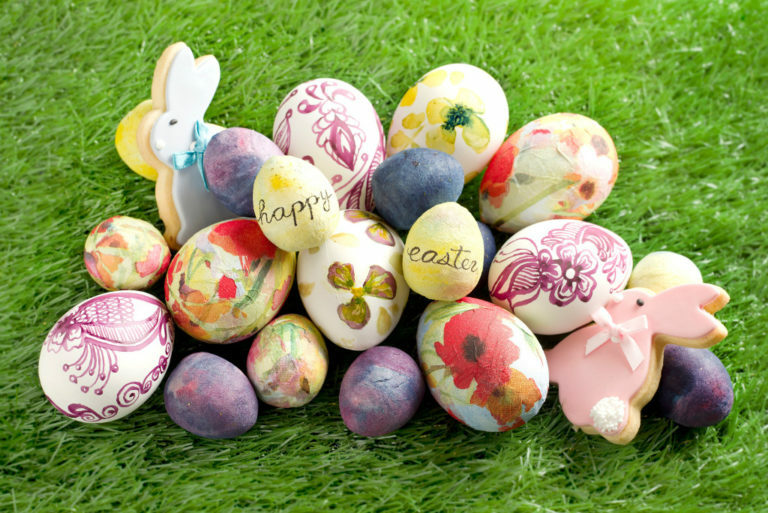 For starters, 100 colourful eggs packed with treats will be waiting to be discovered in the grand Easter egg hunt. Also enjoy the Bunny Hop, Easter egg-painting, Capoeira demonstration for kids, a book reading and show-and-tell with Vinny the dog. Love Gudetama but you’re not really a lazy egg? 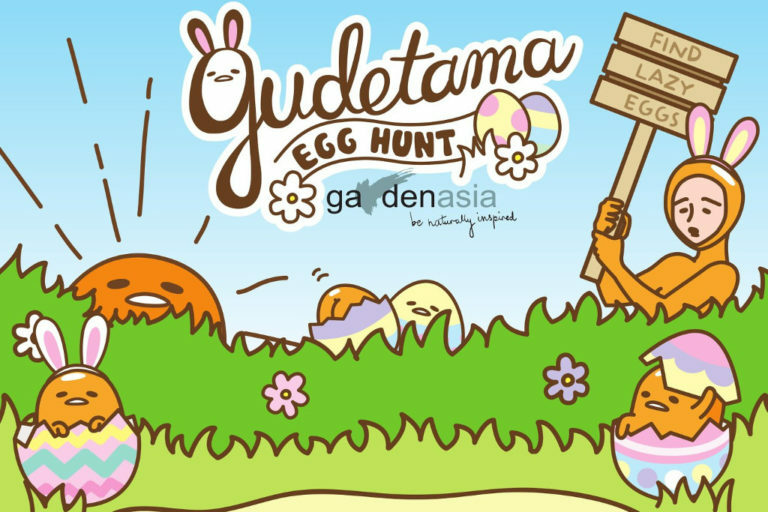 Then join in the Gudetama Egg Hunt for a day of fun with the whole family. Families who sign up stand a chance to win bistro vouchers or even a staycation at Gardenasia’s farmstay villas! You also get a goodie bag worth $68 comprising Gudetama merchandise and even a kids meal at Gudetama Café Singapore. Places are limited, so sign up now! 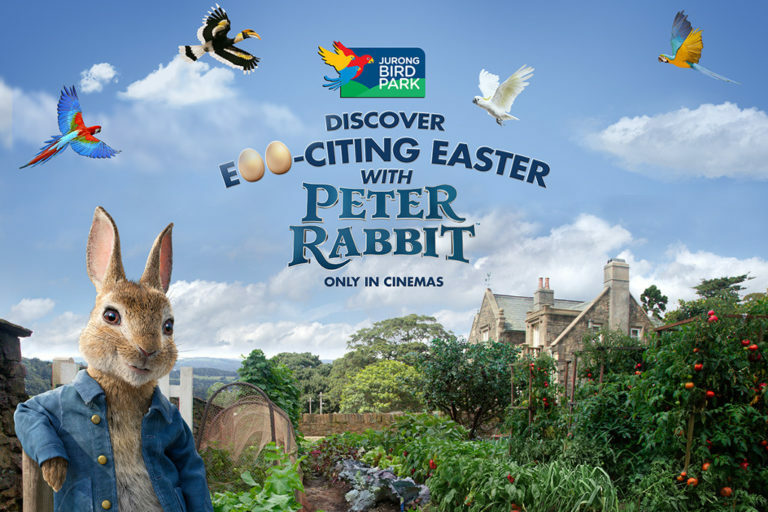 Hop into Jurong Bird Park this Easter and meet-and-greet with Peter Rabbit and friends! The friendly bunny’s vegetable patch will be recreated at the Birdz of Play area. Embark on a hare-raising Easter egg hunt and stand to win Peter Rabbit movie premiums. Kids can also take part in Easter craft activities, learn about eggs and even watch young birds pry open their Easter treats. Hungry? Indulge in mini bunny baos, scotch eggs and hot cross buns at the park’s F&B outlets. 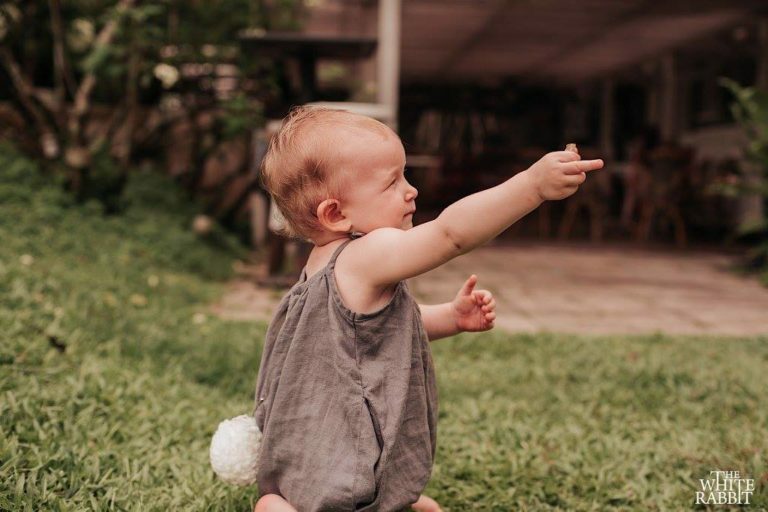 Dress up in your Easter best, or try on a sarong kebaya or batik shirt for a fun photo op at the Easter Sunday edition of Straits Family Sunday. 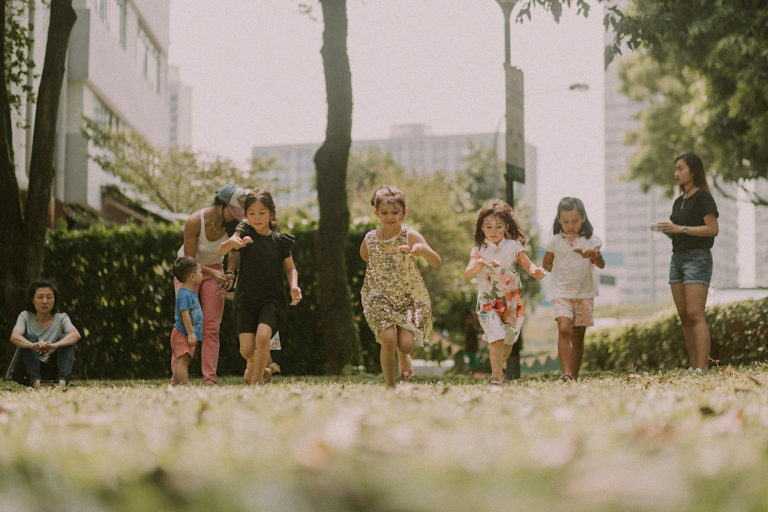 Hunt for bunnies and other interesting animals during an interactive guided tour as you explore the colourful world of Peranakans. 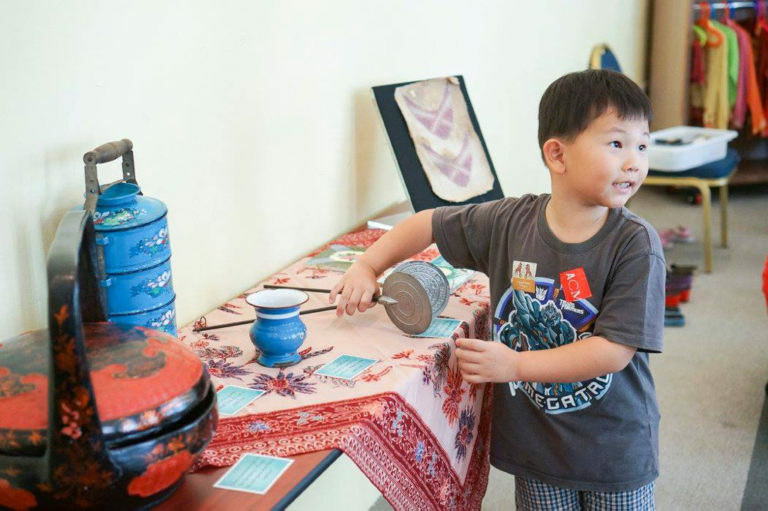 You’ll also get to create your own Easter-themed artwork to take home after a fun-filled Sunday at Peranakan Museum Singapore. Calling all bunny lovers, head to Easter Fun Day at Tree Lizard Restaurant & Bar. Part of the proceeds go to House Rabbit Society Singapore, who will be hopping by to share rabbit care tips. There will also be a magic show and an egg-painting contest conducted by Art Boot Camp. 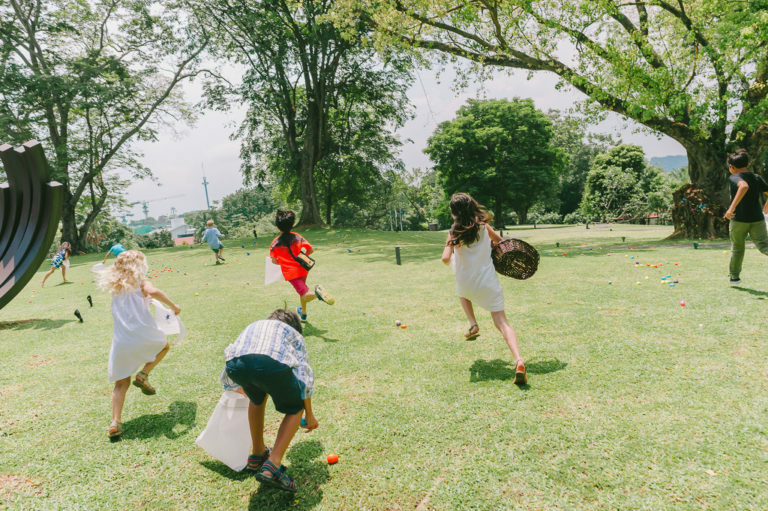 Not to forget the annual Easter egg hunt extravaganza boasting over 350 eggs hidden around the lush lawn and playground, with chocolates, toys and other amazing prizes at stake. Get your tickets and make your lunch reservations soon! If your little ones are fans of The Polliwogs, then they won’t want to miss the Easter Egg Hunt challenge at Waka Waka by The Polliwogs. Hunt for eggs throughout the play arena and stand to win free a return trip to their favourite play centres. They’ll also enjoy a special Easter show where they get to play games with The Polliwogians. It’s sure to be a seriously fun time. The event also takes place at Eastpoint Mall and VivoCity outlets at the same time on 23 March. This one-day-only ticketed gastronomic event will see an extensive spread of Easter delicacies and confectionaries. Enjoy signatures from seven shophouse-inspired venues at Alley on 25, Andaz Singapore’s all-day dining venue. The theatre kitchens will also feature festive specials such as baked shakshuka, coq au vin, Mediterranean sea bass and whimsical Easter chocolates. Kid-friendly highlights: Dine on kid favourites ratatouille, roasted pumpkin soup, harissa sausages and a chocolate fountain. 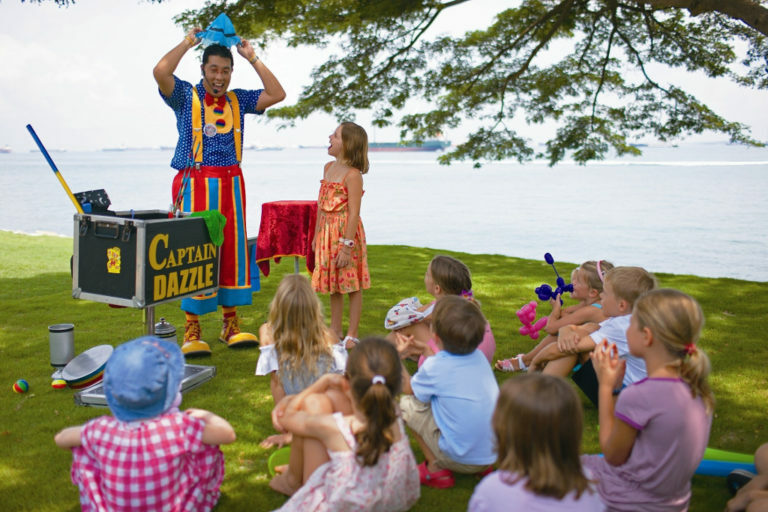 Fun-filled Easter activities and roving entertainment will keep the little ones amused. 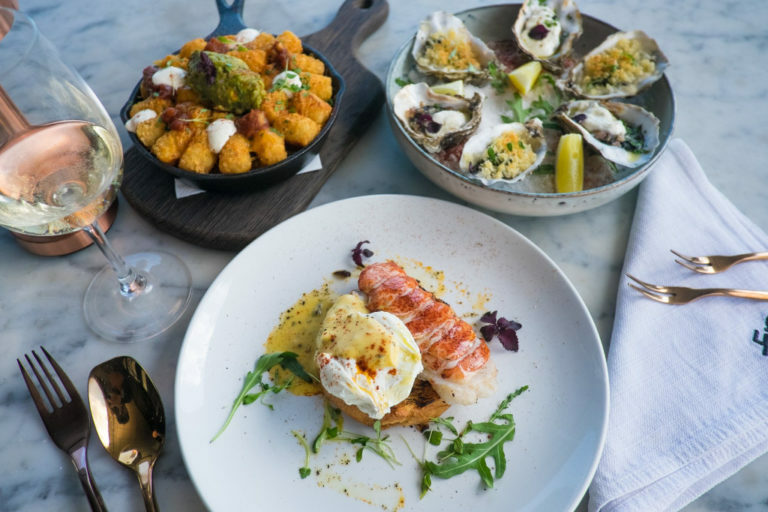 Tuck into all-you-can-eat fresh oysters and bottomless orders of pots of mussels and clams at Angie’s Oyster Bar this Easter. The buffet will also feature appetisers and sides galore, including mac ‘n’ cheese and tuna nicoise. Be sure to try Angie’s Easter Lobster Eggs Benedict that will be available till 15 April. Other highlights include the made-to-order egg station and DIY Pimp Your Prosecco bar. Kid-friendly highlights: Kids get their own Little Easter Bunny Menu and can take part in the Easter egg colouring competition. Celebrate with friends and family over brunch signatures from three culinary theatres. Easter classics include roasted Australian lamb leg, braised beef short ribs, deviled egg tartlet and carrot orange velouté. 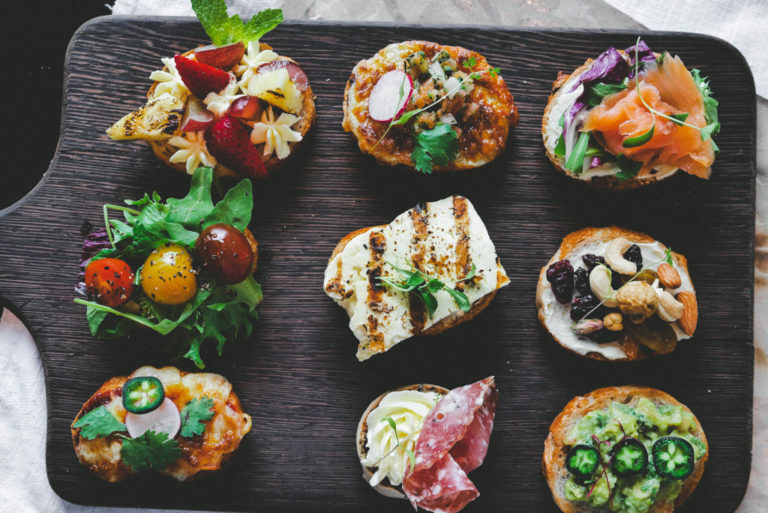 These in addition to Ash & Elm’s iconic tasting platters comprising nine spring-inspired a la minute petit plates. You’ll also find Simnel cake, Easter rice tart with lemon meringue and carrot orange panna cotta in the festive dessert showcase. Kid-friendly highlights: Look forward to an afternoon of exciting activities including Easter egg painting and balloon sculpting. And don’t forget those royal hazelnut chocolate eggs! Take the family to Changi Airport’s Terminal 3 and indulge in a sumptuous Easter Sunday brunch at Azur. Buffet highlights include stuffed Easter eggs, three cheese baked pasta, scalloped potatoes, prime beef ribs and braised lamb leg. Savour sweet treats such as classic Easter carrot cake, hot cross buns and strawberry rhubarb pie from the dessert bar. Kid-friendly highlights: Bar ’75 just across from Azur is transforming into Kids Wonderland. There’ll be a movie screening, egg-painting, an Easter egg hunt and a dedicated kids’ buffet spread. Easter Bunny will be stopping by too! 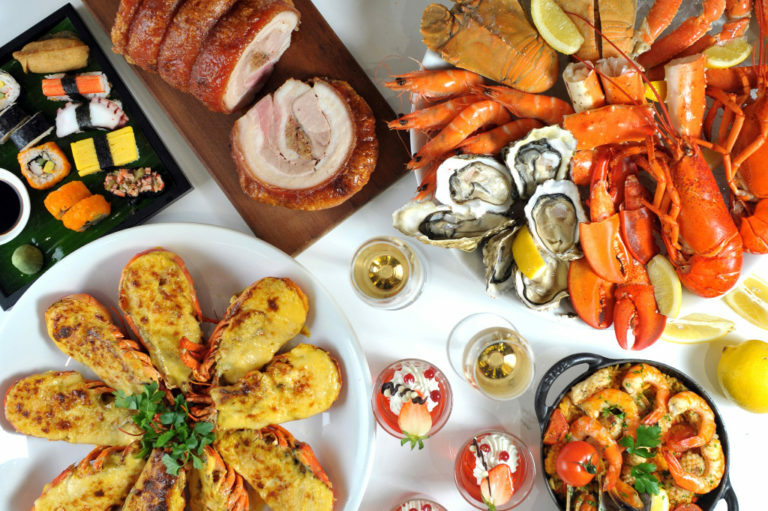 Dine by Siloso Beach waterfront on beef wellington, lamb carvings, Alaskan king crab legs, Fine de Claire oysters and more. 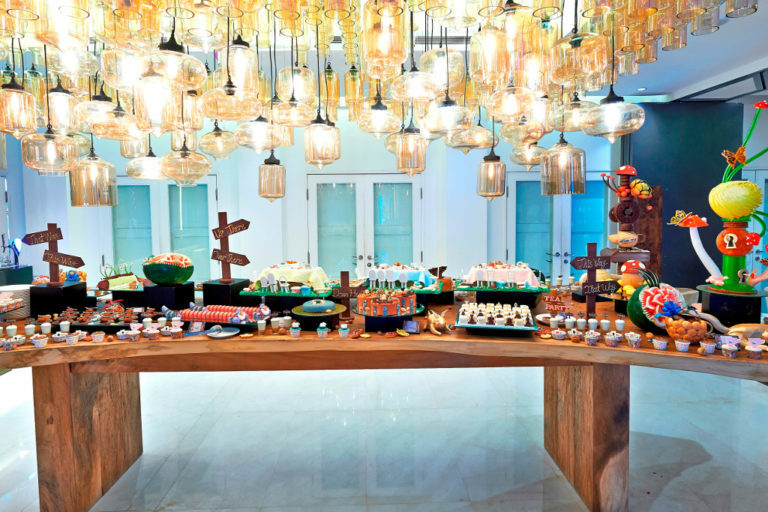 Complete the buffet spread with free-flowing champagne, DIY mimosa cocktails and mouthwatering desserts for an idyllic afternoon. Alternatively, an Eggstraordinary Buffet will also be happening over at Silver Shell Café. Kid-friendly highlights: Dedicated children’s activities include Easter egg hunts, egg-painting sessions, balloon-sculpting and a magic show. Diners also get complimentary access to the resort’s swimming pools, so remember to bring your swimwear! Bond with the family at the resort’s Grand Ballroom Foyer over an impressive spread of brunch delights. Live stations will be serving up rotisserie meats, pasta, fresh seafood, Mediterranean and Asian fare, among others. 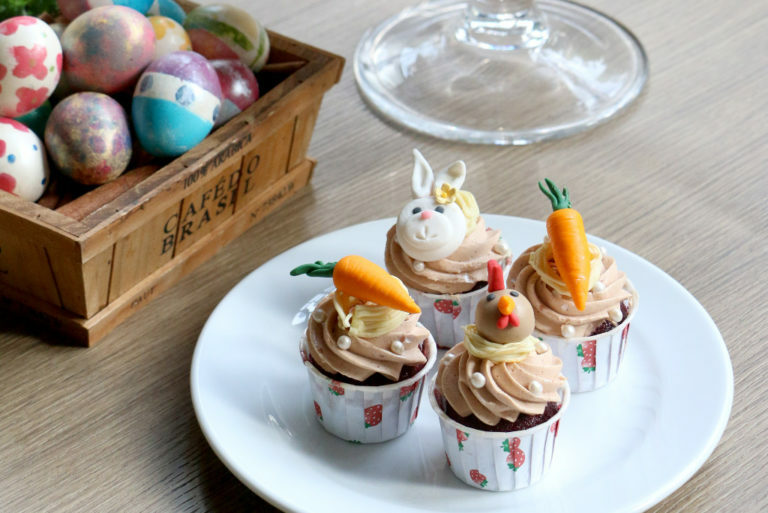 Dessert lovers can look forward to an expanded section of handcrafted Easter-themed delights. 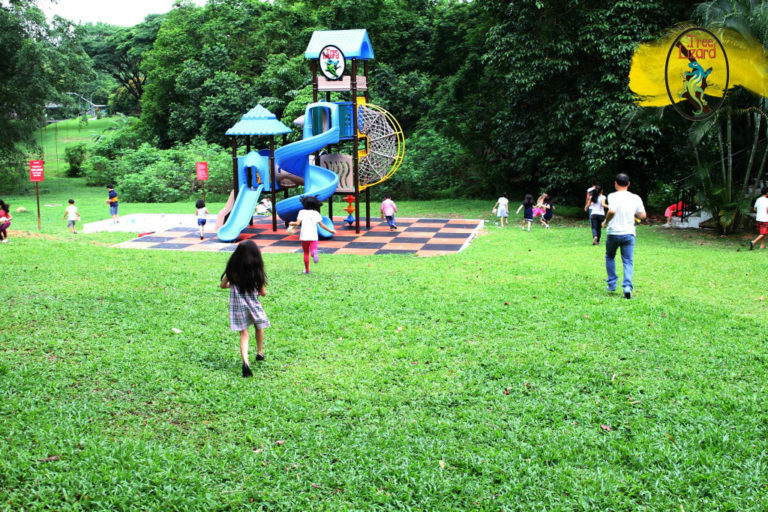 Kid-friendly highlights: Little ones will enjoy fun activities including egg- and face-painting, a ball pit playground and a bunny corner. The annual Easter egg hunt on the front lawn is the big event, with 10 attractive prizes to be won. 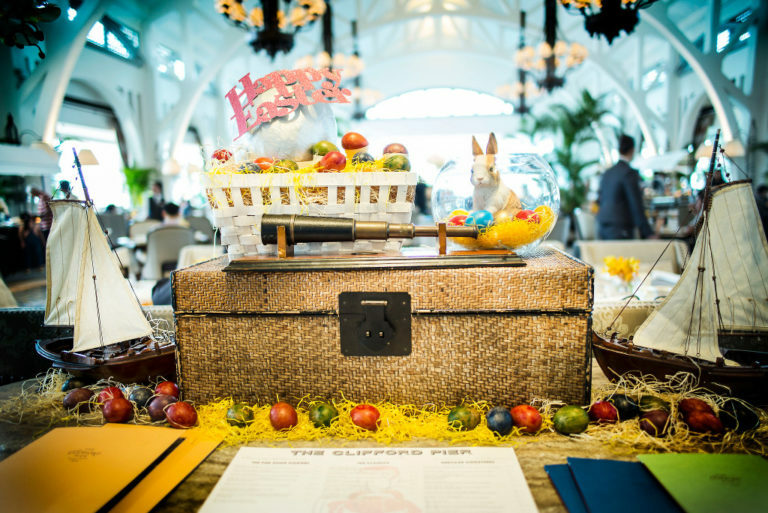 Participate in the Easter revelry as Colony presents a Charlie and the Chocolate Factory themed brunch extravaganza. Gourmet delights include gold brain eggs with avruga caviar and shaved parma ham infused with truffle, Easter pie with black forest ham and ricotta, and baby lamb with Mediterranean herbs and greens. Five lucky diners who find a ‘Golden Ticket’ in their chocolate bar will stand to win attractive prizes from a staycation at the hotel to a relaxing massage at its in-house spa. Kid-friendly highlights: Watch out for a special appearance by Willy Wonka while having fun at the Easter crafts stations. There’ll also be yummy chocolate Easter eggs for that little sweet tooth. Spend quality time with loved ones this Easter Sunday at Edge munching on an array of delightful treats. 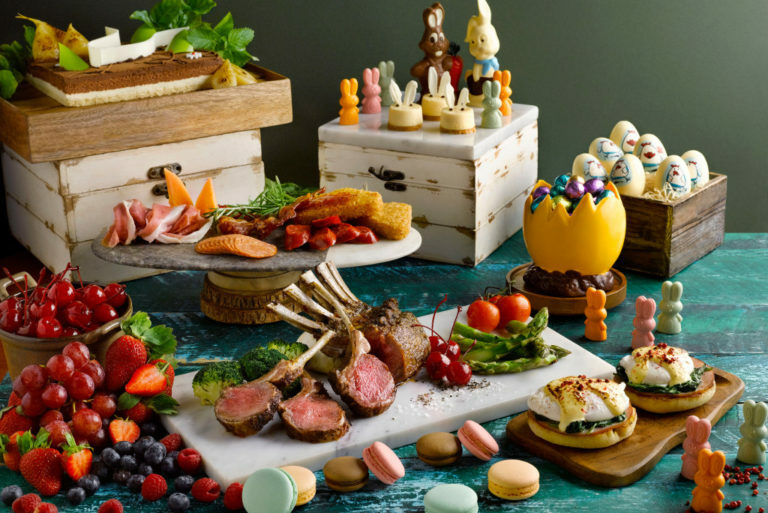 Between seafood on ice and classic Easter treats such as hot cross buns and orange praline gateau, tuck into roasts from the carvery including confit lamb with pistachio and herb crust, roasted USDA prime rib and oven-roasted raspberry pork ribs. Kid-friendly highlights: An afternoon of interactive fun awaits, beginning with a hunt for Easter eggs at 3pm. The Easter Bunny will also be making its rounds with goodies and photography mementos to complete your day. The annually sold-out Easter in the Park begins with The Great Easter Feast in the Grand Marquee. Buffet highlights include fresh seafood, roasted traditional turkey breast, roasted lamb leg and ground masala spice wagyu beef meat balls. A selection of vegetarian delights will also be available, as will an array of Easter bunny-themed desserts. Kid-friendly highlights: Besides feasting at the dedicated kids’ buffet station, take part in the Pixies Easter Egg Dash across the Garden Terrace, the Enchanted Garden Piñata Bonanza and a Best-dressed Fairy and Pixie contest. There’ll also be a bouncy castle and other toys and slides at hand. Enjoy eggstra special Easter delights such as deviled egg trio, lamb with mustard-glazed potatoes, and roasted chicken with fresh herbs. Gratinated cauliflower with cheese, creamy courgetti lasagna and spiced hot cross buns are other must-tries on Latest Recipe’s Easter spread. Then discover the beach bunny-inspired dessert buffet featuring spiced pear and summer berry crumble, maple candied walnut financiers and more. One lucky diner gets to win a two-night stay in Le Méridien Phuket Beach Resort’s Ocean View Junior Suite! Kid-friendly highlights: For starters, each kid is welcomed with a free ice cream float. There are also popcorn and frosted meringue stations for more yummy treats. Then take part in an egg-painting competition and have some hoppity fun in the bouncy castle. 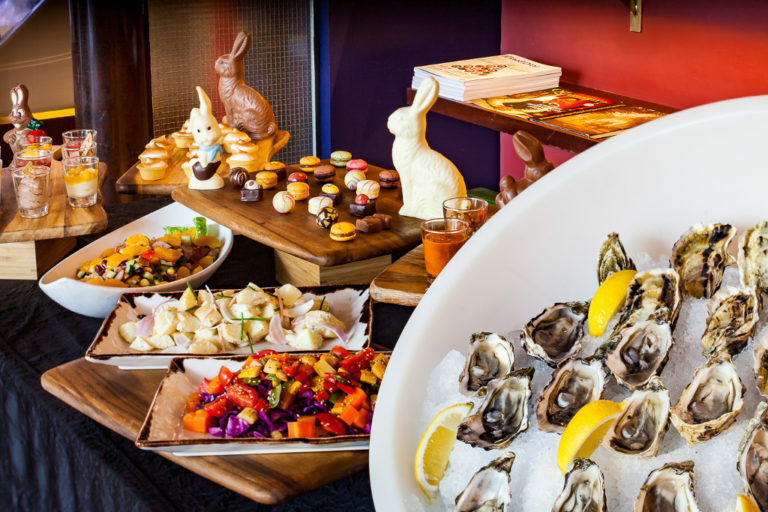 The Easter Super Sunday Lunch at Lime Restaurant will feature a lavish spread of fresh seafood, oysters and meat carvings. Alongside are live stations serving up sous vide egg with lobster and truffle sauce, Welsh rack of lamb, pan-fried foie gras and raclette cheese. Apart from the extensive dessert station, look out for service ambassadors preparing the classic French Crêpe Suzette tableside. Each diner also gets one Easter Egg Hunt prize redemption chance. 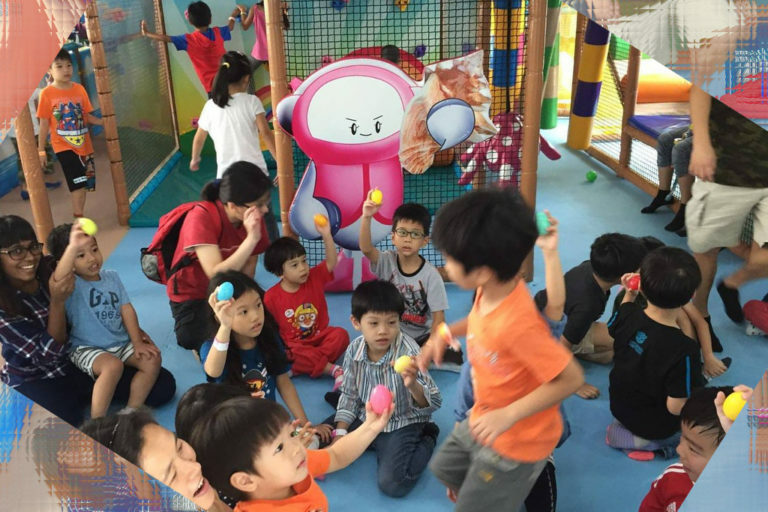 Kid-friendly highlights: Fun and games are on the menu at the Easter Kiddy Corner, starting with an Eggs-citing Easter Egg Hunt. Also expect a bouncy castle, face-painting and balloon-sculpting, as well as a GIF photo booth with the Easter Bunny. Indulge in a mélange of over 70 Western and Asian delicacies, alongside premium seafood on ice and enticing Easter treats. Highlights on this buffet spread include scallop ceviche tuna tartar, seared duck foie gras and roast prime rib of beef. Another hot favourite is the pork saddle with prunes and pancetta stuffing. Then don’t forget the hot cross bun pudding, lemon curd cookie nests, Easter rainbow cake and more. 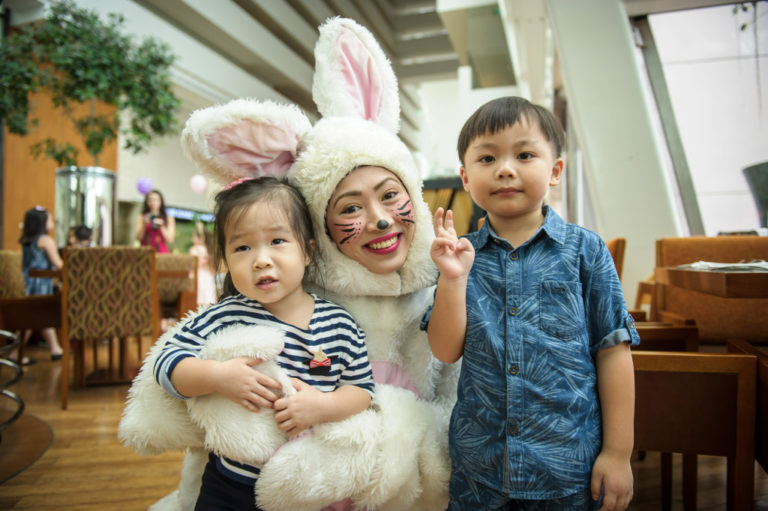 Kid-friendly highlights: Marriott Cafe will be transforming into an Easter Wonderland where kids will have a whole afternoon of fun and entertainment. 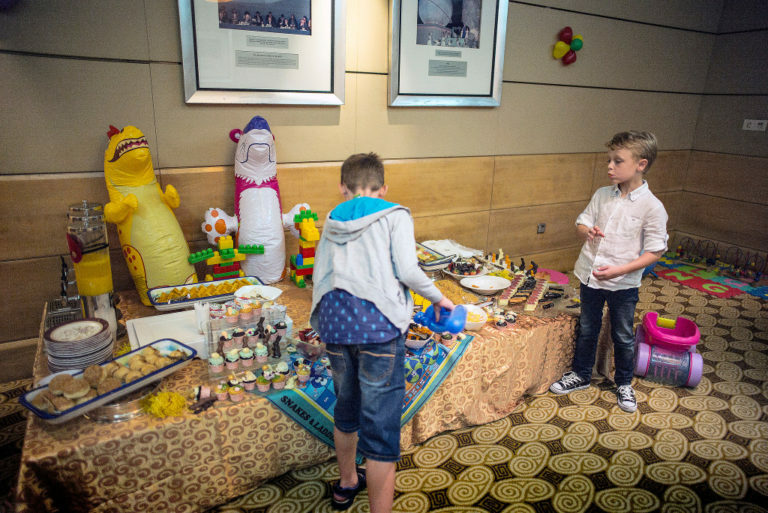 There’s plenty of chocolate eggs and bunnies at the extended dessert station too! Feasting awaits the whole family at Melt Café, beginning with familiar favourites such as slow-roasted beef and warm shepherd’s pie. Fresh seafood options include Boston lobster, while herbed lamb chops and garlic prawns await at the barbecue station. If you prefer a traditional Italian spread featuring torta pasqualina pie, make your reservations at Dolce Vita’s brunch instead. Kid-friendly highlights: Check out the Easter farmhouse of assorted macarons, hot cross buns, chocolate fountain and freshly baked waffles. Also, meet the Easter Bunny and participate in an egg hunt in the garden, with special giveaways up for grabs. 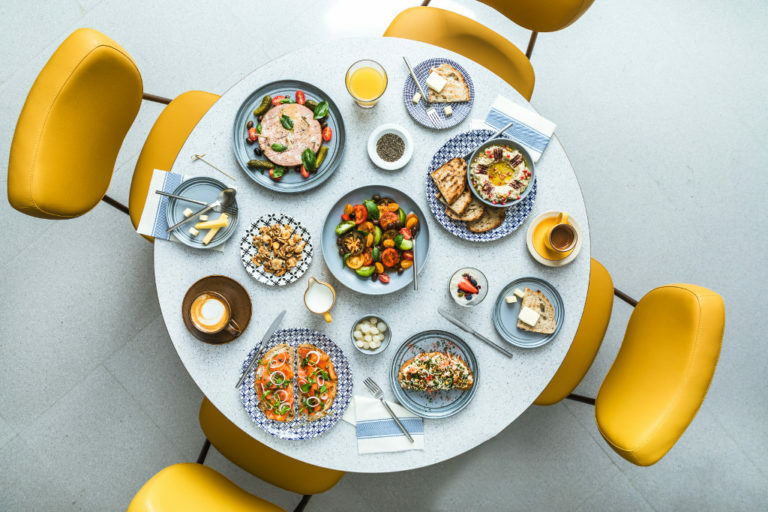 As Oasis transforms into a fun Easter house, indulge in live carvings of slow-roasted whole Australian lamb with shawarma marinade and char-grilled whole New Zealand snapper with lemon and fennel pollen. Sustainable seafood on ice and traditional Easter favourites such as hot cross buns and mini berry crumbles also await. 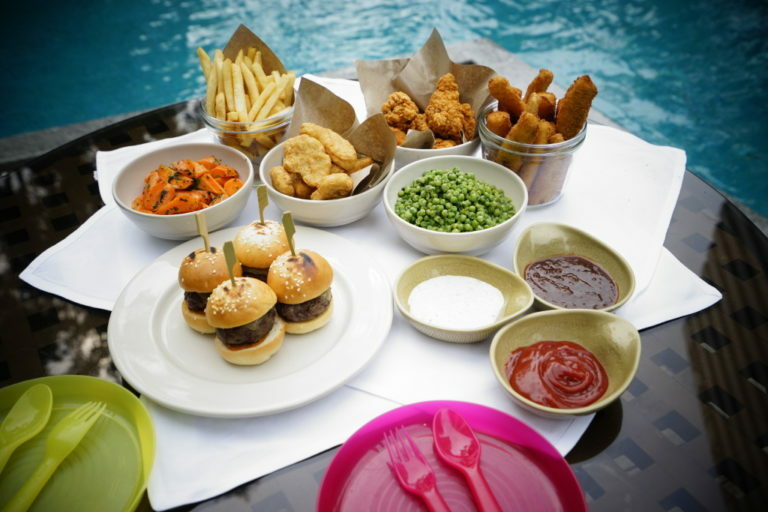 Kid-friendly highlights: A kids’ spread will be specially curated for the little ones, including mini cheese burgers and sustainable fish fingers. Also, get to meet the adorable Easter Bunny and have fun with egg-hunting and face-painting activities. Create joyful memories at one of the best Sunday buffet brunches in the city at Opus. 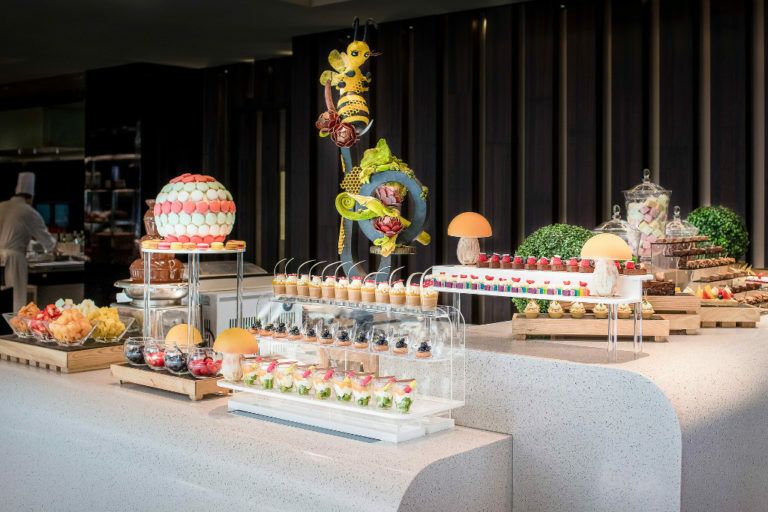 Pick from eight live stations, ocean-fresh seafood, dedicated cheese room with Swiss raclette cheese and six-metre showcase of Easter desserts. The open-flame charcoal grill takes centrestage with US prime ribs, suckling pig, herb-roasted leg of lamb and Sakura chicken. Eggstra yummy dishes include seared foie gras with quail egg sunny side up and scotch egg with black truffle hollandaise. 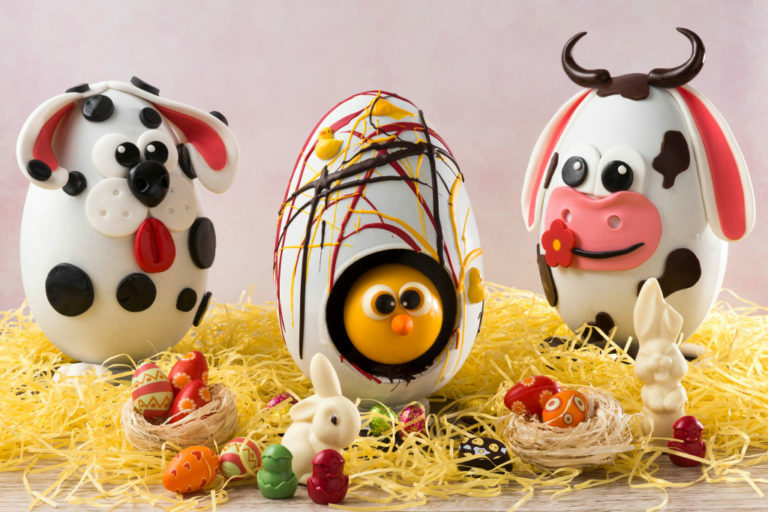 Kid-friendly highlights: Apart from every kid’s favourite chocolate fountain, expect colourful Easter chocolate eggs and bunnies. If a semi-buffet is more up your alley, head to PORTA and pick your main course from the all-new brunch menu. You can’t go wrong with the 62°C Eggs Benedict or Wild Mushroom on Toast. Then indulge in a free-flowing gourmet oyster bar and unlimited servings of salads, sides, appetisers and desserts. 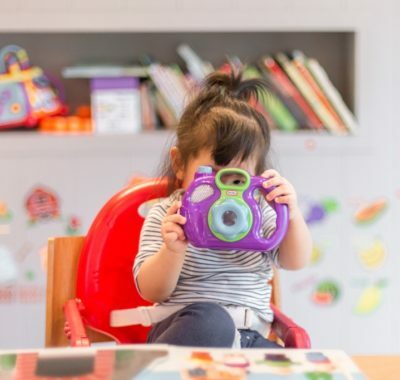 Kid-friendly highlights: Kids will love the Apple Bacon Pancake and Cheesy Brioche from the brunch menu, while the littlest ones under five get a complimentary Dish of the Day each. Then head to PORTA’s Map Room that will be decked out for the occasion. Activities include painting Easter eggs, making bunny masks and simply having fun amid caterpillar tunnels and rocking horses. Get together over Singapore’s first-of-a-kind brunch teeming with authentic French dishes alongside refined Chinese delicacies at Racines. A dedicated truffles station offers truffle tempura, truffle egg royale and more. Other live action stations feature Maine lobsters, foie gras, abalone and rack of lamb, plus seafood and desserts galore. You’ll also receive 20 per cent off Sunday Family Brunch on your next visit. 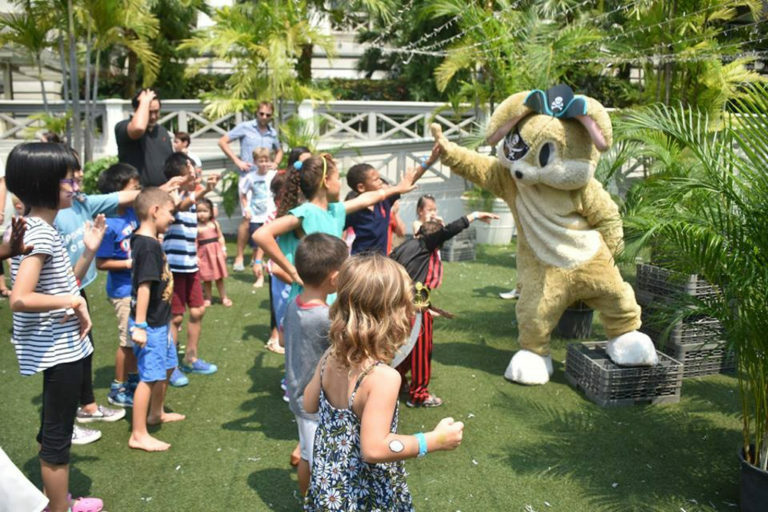 Kid-friendly highlights: A Golden Egg Easter egg hunt with fun prizes takes place at The Lawn. And for the little ones, a Cool De Sac kids activity corner awaits. 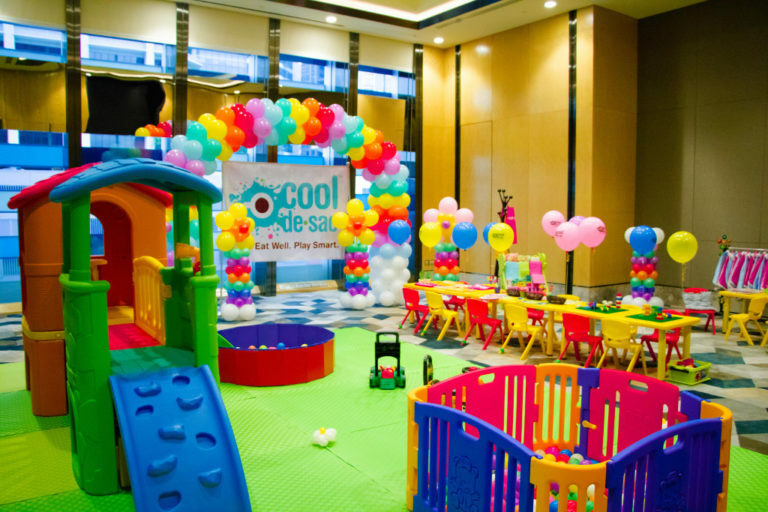 Let the childcare professionals lead the kids in creative play and themed craft activities while dads and mums relax. 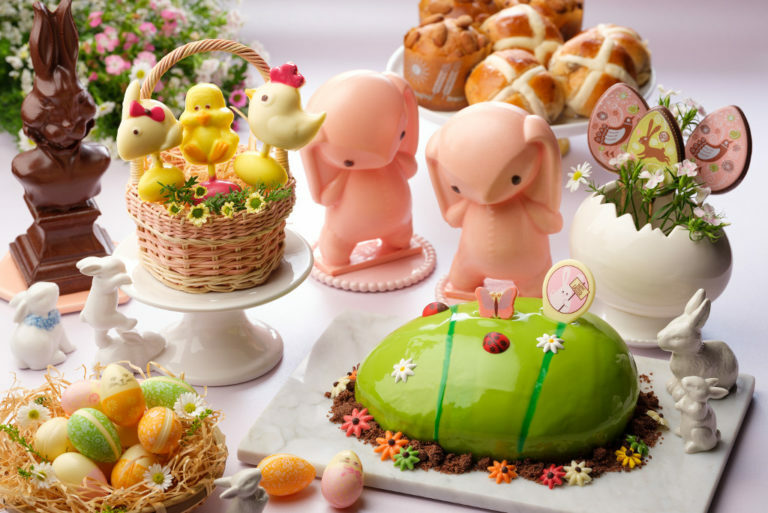 The international buffet restaurant at Marina Bay Sands Hotel tops up its spread with an array of Easter specials. Try beef wellington and slow-cooked Spanish Iberico pork shoulder at the live carving station, or a comforting bowl of Buta Don, seasoned pork slices and onsen egg atop a bowl of Japanese pearl rice. Complete the meal with RISE’s signature desserts, including the classic Easter tribute – hot cross buns. Kid-friendly highlights: Enjoy a special kids’ corner with treats such as mac ‘n’ cheese and churros. Then go egg hunting at RISE’s edible herb garden and decorate Easter eggs and muffins to take home. Hop on over for a cosy family celebration at Royale, where a buffet feast of over 40 dishes awaits. Tuck into traditional Easter Sunday delights such as eggs benedict and egg en cocotte with tomato prawn stew. Special entrees include barbecued baby back ribs, slow-roasted rack of lamb, prawn bisque and charcuteria platter. Then spoil your sweet tooth with bunny chocolate dip, pear-white chocolate cake and more. 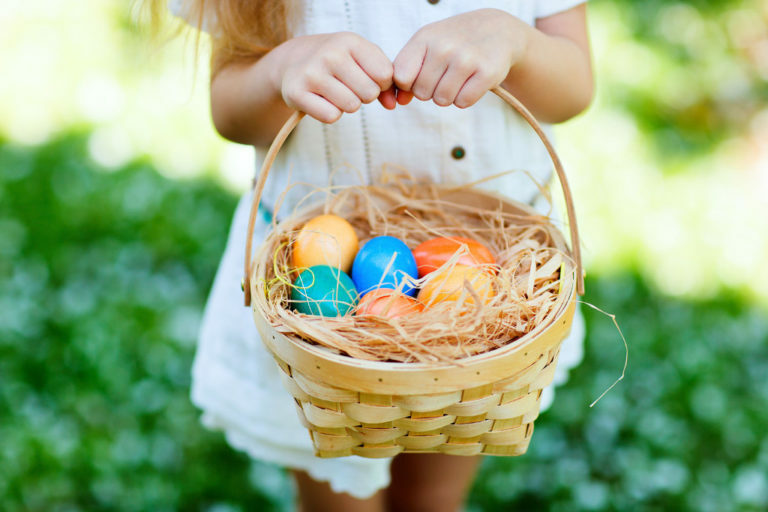 Kid-friendly highlights: Embark on an Easter egg hunt, with prizes to be won. Other fun activities include a bouncy castle, face-painting and Easter arts and crafts. Perfect for a family of carnivores, the buffet line-up at SEAR includes brunch mainstays focused on all things grilled. Pick your preferred toppings, such as scallops and cauliflower, and foie gras and truffle cream cheese, at the made-to-order bruschetta bar. Then have your eggs done just right at the made-to-order egg station too. Kid-friendly highlights: Kids can fuel up on the Little Easter Bunny menu. The little ones can also take part in the Easter egg-colouring competition. 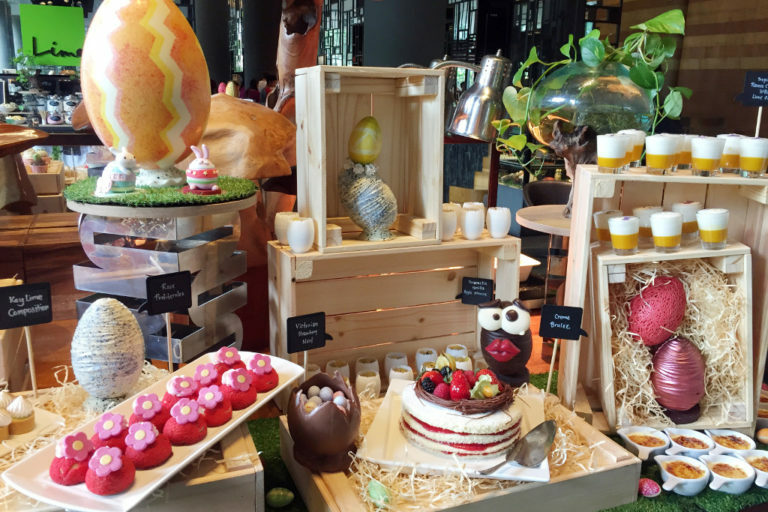 Attend Easter brunch in your Sunday best as the Easter-edition Sunday Brunch makes an exclusive appearance at The Clifford Pier. 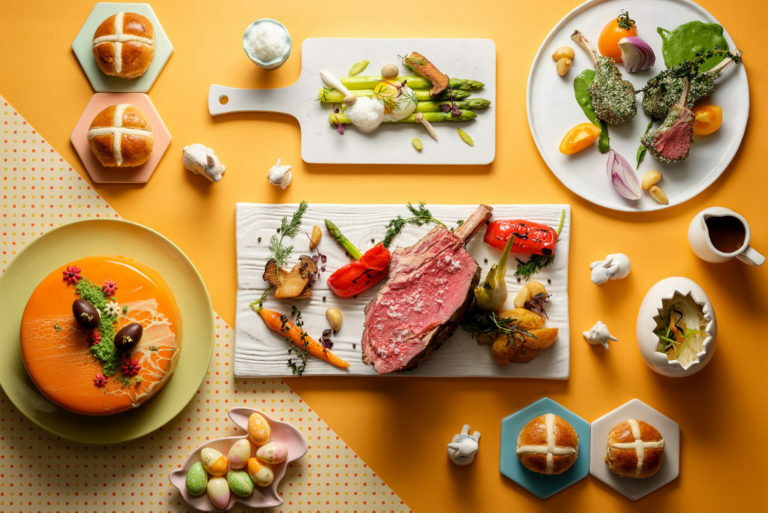 Breakfast items like sous vide egg with spicy chorizo and truffle sit alongside a carvery with slow-roasted prime rib and torta pasqualina, a traditional Easter ricotta and spinach tart. You can even opt for a scoop of teh tarik ice cream with your Easter cupcakes for an east-meets-west dessert! La Brasserie is also serving La Famille Brunch if you prefer a classic French Easter. Kid-friendly highlights: Arts and crafts, face-painting and finger food for the kids will be available at the dedicated children’s room. The hotel’s much-anticipated annual Easter egg hunt commences at 3pm at The Floating Pods. It includes a series of giveaways for kids who collect the most eggs! Dine in the serene setting of The White Rabbit in the idyllic Dempsey enclave this Easter. Start at the live carving and egg stations, seafood bar and range of appetisers. Then tuck into pan-roasted saltbush lamb saddle, sous vide chicken leg, pan-seared fjord trout and arancini. Desserts include Easter cookies, cream cheese crumble and vanilla and chocolate mousse. Kid-friendly highlights: Kids can choose their mains from tomato and meatballs conchiglie, poached barramundi and rosti with honey-baked ham. Expect an extra bouncy helping of fun with candy floss, bouncy castles, balloons and storytelling sessions. Gather the family at Town Restaurant’s Easter Sunday champagne brunch, featuring a feast of breakfast items. Think traditional eggs benedict, fresh ocean spray with snow crab, roasted US prime rib and even Japanese delicacies. 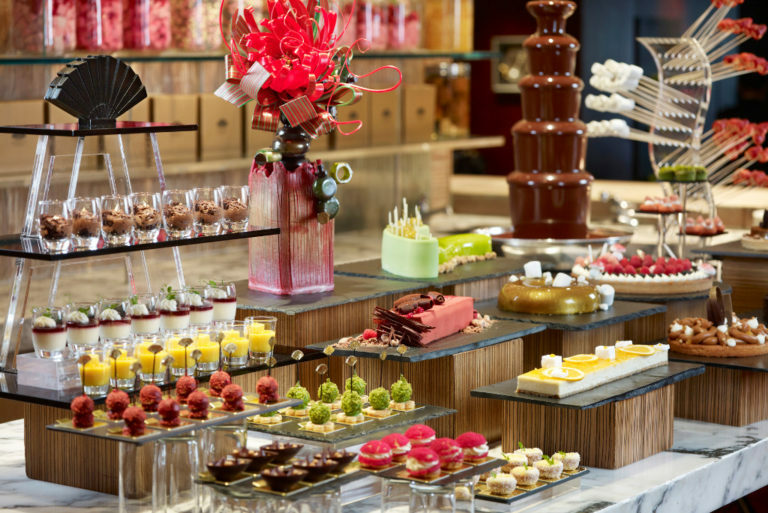 End the decadent meal on a sweet note with 27 desserts and a towering chocolate fountain. Alternatively, head to The Lighthouse Restaurant for Buona Pasqua semi-buffet Italian lunch. Kid-friendly highlights: The annual Fullerton Easter egg hunt is always a main highlight. It hops off at 1.30pm at the East Garden, with prizes for those who find the most eggs. The dedicated children’s corner also offers yummy finger food, Easter egg-decorating and balloon-sculpting for the kiddies. For one-stop shopping for all your Easter party needs, why not simply drop by your neighbourhood supermarket? Or simply shop online and have everything you need delivered to your doorstep! Cold Storage: It even has Easter products that can only be found locally at Cold Storage outlets, such as Jacquot Chocolate Eggs and the adorable Reese’s Mini Reester Bunnies. Redmart: If online grocery shopping has become your norm, then you’ll surely be familiar with Redmart, but did you know it has a great array of Easter goodies too? 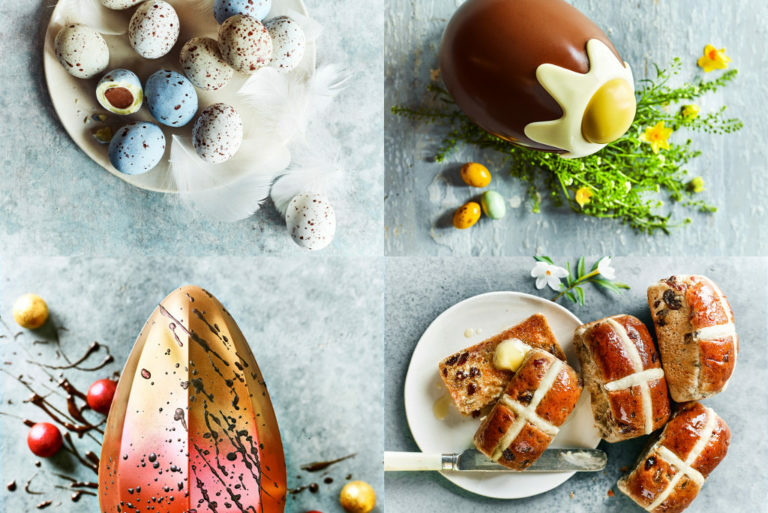 For a more luxurious taste, you can’t go wrong with Easter chocolates and treats from these. View their Easter range in-store or via the links below. Happy hunting and have a hoppy Easter!